The Secretary of State of Oregon facilitates an online business entities search tool for use of the public where one can get access to the details of the corporate entity one is searching for. Once you have the business entity name or the registry number handy, you can easily get through the information you want. Below is a step by step guidelines on how to use the Oregon business search tool. 1. The first step is to access the Oregon business search page by clicking here. The screenshot shows this below. 2. 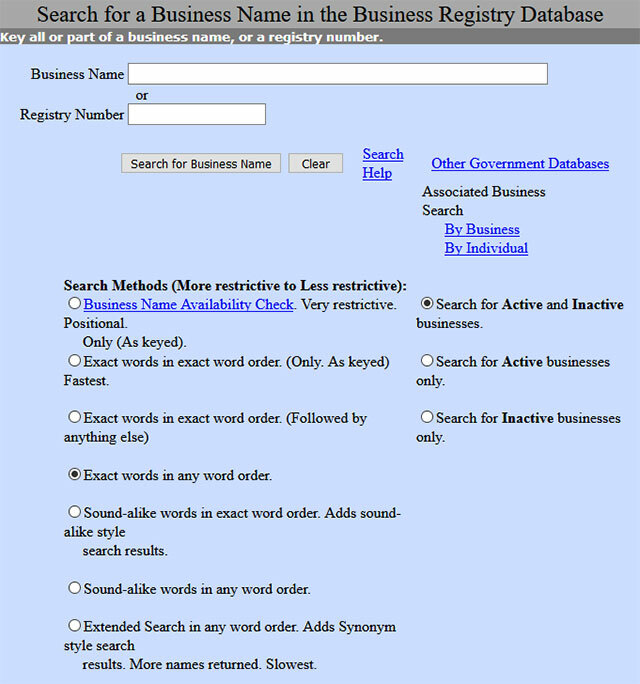 The business search form allows you to search by either the name or registry number. They also provide additional search options to help widen or narrow your search. This includes different search methods and search status. For this example we will be searching by name. 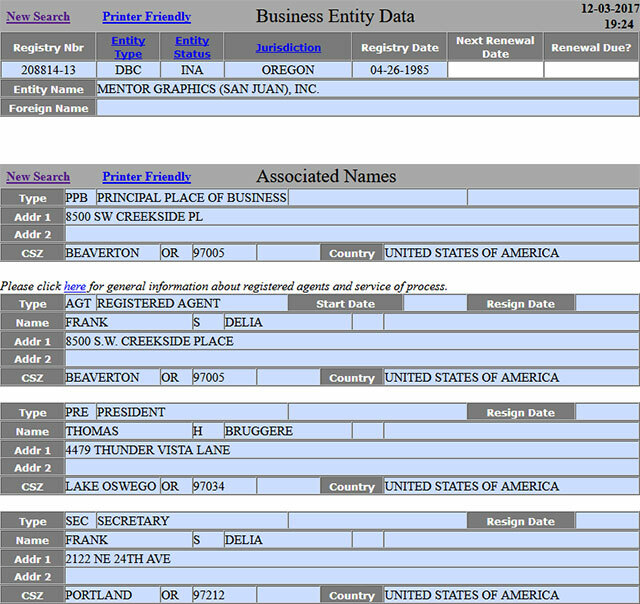 In the "Business Name" field type in "Mentor Graphics". Then under "Search Methods" select "Exact words in any word order". For status we want to select "Search for Active and Inactive businesses". 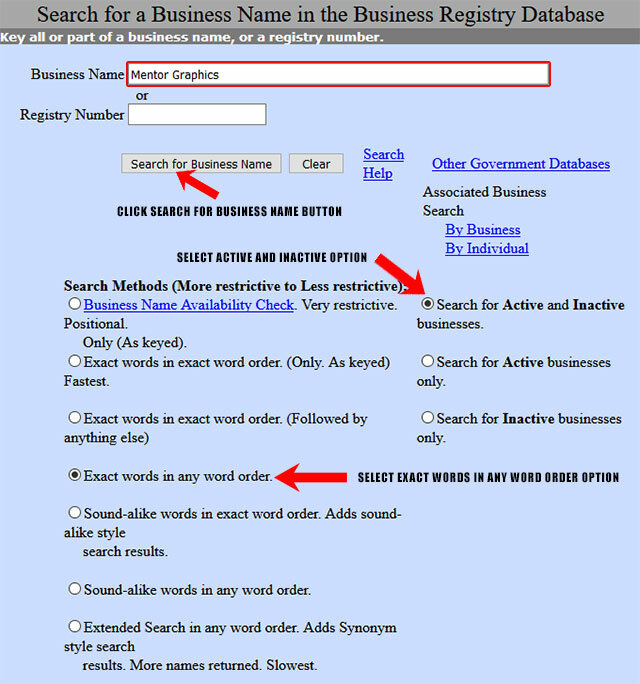 Once you have done this, click the "Search for Business Name" button as illustrated in the screenshot below. 3. Once you click the "Search for Business Name" button, the system will take you to another page showing a list of results that match your search criteria. It shows the record number, entity type, status, registry number, status and name for each business entity found. To view the details for a business entity, click on the name of the business. This is shown in the screenshot below. 4. Click on an entity name in the result page to get further details about that business entity. It will take you to a page that displays information that includes the Entity name, type, status, registration date, address etc. Refer to the screenshot below. 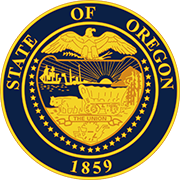 The Secretary of State of Oregon is an elected constitutional office in the US state of Oregon. The office lies in first line of succession to the Governor of the state. The current Secretary of State of Oregon is Jeanne Atkins who is a democrat and was appointed to the office by the Governor of the state, Kate Brown in March 2015. Since she was not elected but appointed, she has no right to be in the succession line of the Governor and the first line to governorship goes to Treasurer, Ted Wheeler.